Friends of Portsmouth were busy putting the final touches on the ice skating rink at Second and Market streets in downtown Portsmouth this week. The skating rink will remain up throughout Portsmouth’s Winterfest activities which begin Saturday. A Christmas tree lighting, your first opportunity to go ice skating in Boneyfiddle, chances to visit Santa Claus, two concerts and quite a few other happenings are on tap for the first weekend of the inaugural Toyota Winterfest at Market Square which kicks off this weekend as planned and organized by the nonprofit Friends of Portsmouth. Sitting at the corner of Second and Market streets, the much talked about temporary ice-skating rink opens for business 11 a.m. Saturday said Nick Rutman, of the Rutman Burnside Realty Group as well as a member of the Friends of Portsmouth who has volunteered to be the community group’s spokesperson. The rink reaches a diameter of 35 x 65 feet with the skating surface made of a plastic that simulates ice but does not need to be frozen. “Temperature is not going to be a problem, we can use it anytime we want,” said local developer and one of the founders of Friends of Portsmouth, Tim Wolfe. To the left of the skating rink has been constructed what Rutman called “Vendor Village.” In an impromptu interview Thursday evening, Wolfe said a wide range of goods will be available from the various booths. For example, he mentioned one booth selling roasted chestnuts and hot chocolate. Rutman said, depending on availability, basically anyone who has something to sell can rent one of the booths for a day or the entire month of Winterfest, which runs throughout December. Next to Vendor Village sits Winterfest’s official Christmas tree set to be lit up during a lighting ceremony 5-7 p.m. Saturday. Local eye doctor, Mike Raies and his band the Bad Habits will provide musical entertainment. The day’s other concert will feature Lucasville country act the Josh Stewart Band, who are celebrating the release of their first CD “This and That.” The band will perform 1 p.m. Saturday. If your holiday plans call for taking the kids to visit Santa, Winterfest can help make that happen. Jolly Old Saint Nick will be in the Winterfest gift shop, more commonly known as the former Candyland building, 12-3 p.m., and 5-8 p.m. Saturday. He will be back 12-3 p.m. and 6 p.m. Sunday as well as other days throughout Winterfest. The gift shop itself will open 11a.m. through 9 p.m. Saturday. Full Winterfest hours for the skating rink, visits from Santa and gift shop hours are listed on the Friends of Portsmouth/Winterfest Facebook page. One of the highlights of the upcoming Winterfest is bound to be an attempt to break the world’s record for the largest number of people caroling at the same time. According to Wolfe, the current record is 1,822 set in 2013. Wolfe wants to raise the record to at least 2,000 people. On Thursday, he said a huge number of people already had signed up to be part of the world record attempt set for 7 p.m. Dec. 15. Wolfe noted the record is for “Christmas caroling,” not just singing. With that in mind, participants must actually muster in front of a door and sing in front of it. One catch is, according to Wolfe, the Guinness Book of World Records limits the number of doors to sing in front of to five per street. With that further in mind, Wolfe talked about having a horse-drawn carriage carrying the choir director from Market Street to Second Street with the carolers trailing behind him and affording them the opportunity to knock on more doors on different roadways. “Unfortunately, it’s not as simple as people getting in a circle and singing,” Rutman noted. Rutman said some details of the record attempt still are being worked out, including who will act as choir director. Would be participants are asked to go to Eventbrite.com and obtain a free ticket for the event. You can also obtain tickets through the Friends of Portsmouth Facebook page. Rutman said the tickets are a way of keeping track of the number of carolers. Winterfest also includes numerous other events and features, such as a nativity scene with live animals, carriage rides, events at local retailers, teen nights and a Shawnee State University day at the ice-skating rink. Skating classes will be offered for a fee at different times throughout Winterfest. Skate rentals also are available. Again, for full details check the Friends of Portsmouth/Winterfest Facebook page, www.friendsofportsmouth.com/winterfest. 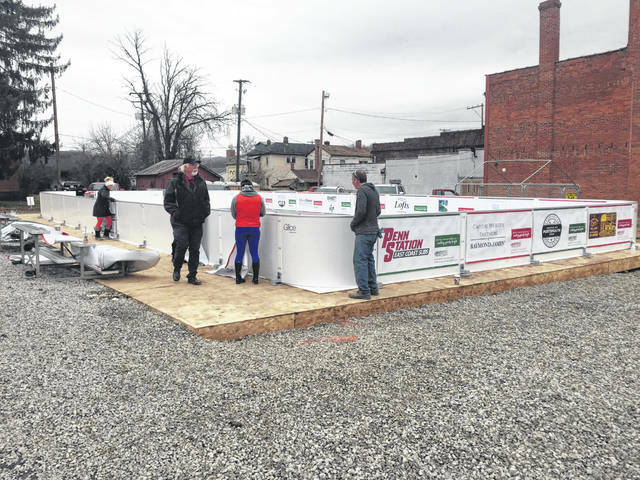 Those interested in renting space at the Vendor Village can call Cindi Hay, 740-285-3260.
https://www.portsmouth-dailytimes.com/wp-content/uploads/sites/28/2018/11/web1_Ice-skating.jpgFriends of Portsmouth were busy putting the final touches on the ice skating rink at Second and Market streets in downtown Portsmouth this week. The skating rink will remain up throughout Portsmouth’s Winterfest activities which begin Saturday.